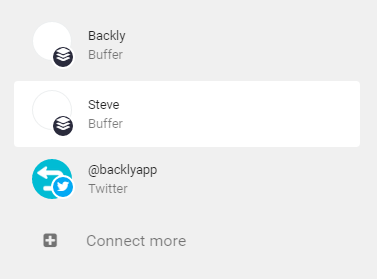 You can connect multiple Buffer and Twitter accounts to automatically convert any links you share into your choice of Backly links all from a single Backly account. There’s no limit on the number of integrations you can add, just click the “Connect more” tab from the integrations page and select which additional service you want to add. Note: You must be logged in to the additional Buffer or Twitter account in the same browser as the Backly account you want to link to. Once connected you should see the extra service in the left tabbed menu where you can now select the default message and enable it. If you have any more questions about this or would like to see more features just let us know.